To help rebuild the lives of Spanish women who have been victims of domestic violence, the Social School for Women’s Empowerment provides merchandising training and confidence-building, offering women professional opportunities. The Spanish government is looking to support victims of domestic violence, both by helping victims take back their place in society and by raising awareness of the issue. Danone, meanwhile, wishes to create a pool of trained ambassadors to connect with its shoppers at the points of sale. With the support of the Danone Ecosystem Fund, Danone Spain and its partners Momentum Taskforce & Fundación Ana Bella, the Social School for Women’s Empowerment has been created to help female victims of domestic violence get back into the job market. A dedicated school provides courses in products and sales, building self- esteem and encouraging social empowerment. Danone and the client companies offer women the opportunity to gain work experience as point of sale ambassadors, with a two-year contract which helps them to rebuild themselves and get back into the labor force one step at a time. This project offers a new way of reintegrating women victims of domestic violence into the community, while changing perceptions in society as a whole. 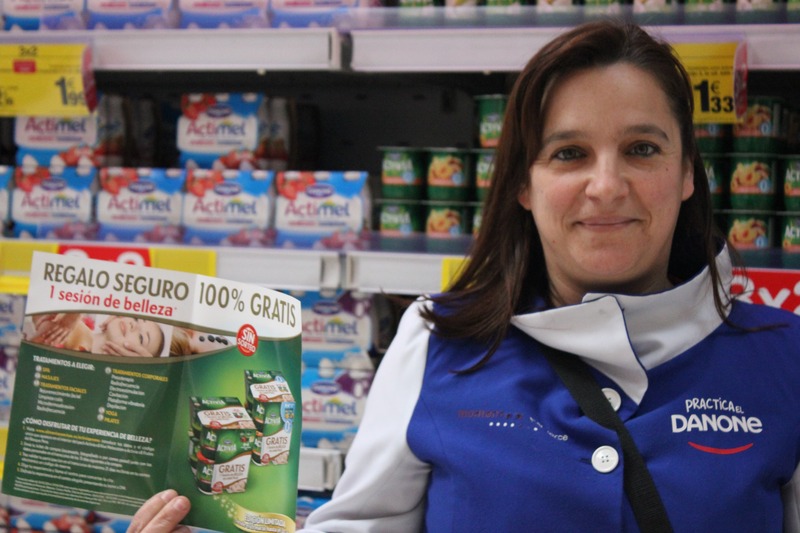 Meanwhile, Danone Spain’s new ambassadors efficiently promote health and nutrition at points of sale. The project is now independent and has been handed over in 2015.